Lock in a great price for Holiday Inn Guayaquil Airport – rated 9 by recent guests! This is the best place to stay as a solo traveler who is just passing through the area. The shuttle service was excellent. They had a sign with my name on it when I arrived to the airport, which was wonderful because I was very confused being in South America for the first time. Very friendly and attentive staff, modern and clean rooms and great room service and hotel restaurant. Access to airport, driver ready at 4:00AM. Had a small dog with us and stayed 2 nights. Did not take advantage of the breakfast buffet but utilized Room Service a lot!!! Would certainly stay here again!!! location is great for airport. food in restaurant was good. property and room were well kept. transportation to and from airport was convenient as long as you call in advance. The location is perfect. It is easier to walk from both the bus terminal and the airport, than taking a taxi. The staff speak perfect English and were incredible! They upgraded us to a suite and were very kind. The facilities are very nice and the restaurant is great. We will use this hotel again and again!! the shuttle waited for over an hour while I had to file a missing luggage report. Breakfast is wonderful! Our flight came in late and we were tired. The shuttle ride takes 30 seconds. Check in was fast. I was in bed within a few minutes of arrival. The staff are efficient, friendly and professional. I woke up sick. The restaurant modified my food options for 2 days. The cleaning ladymade me tea and got me extra water. Holiday Inn Guayaquil Airport This rating is a reflection of how the property compares to the industry standard when it comes to price, facilities and services available. It's based on a self-evaluation by the property. Use this rating to help choose your stay! One of our top picks in Guayaquil.Featuring a business center, an outdoor pool, and a state-of-the-art fitness center with city views, Holiday Inn Guayaquil Airport offers free Wi-Fi and buffet breakfast in Guayaquil. Jose Joaquin de Olmedo International Airport is a 4-minute walk away. 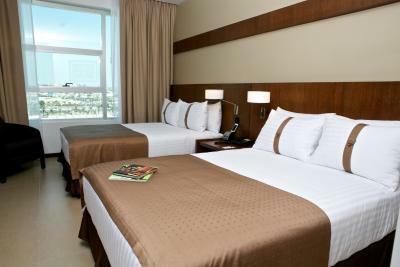 The modern rooms in Holiday Inn Guayaquil Airport feature free Wi-Fi access, coffee machines, and HD TVs. Daily housekeeping service is provided. Holiday Inn Guayaquil Airport offers child care services, as well as dry cleaning and laundry services. The hotel also has a 24-hour lounge area. The property is a 15-minute drive from Guayaquil city center and a 10-minute drive from Guayaquil convention center. This property also has one of the top-rated locations in Guayaquil! Guests are happier about it compared to other properties in the area. 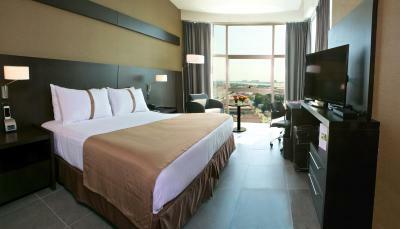 When would you like to stay at Holiday Inn Guayaquil Airport? This room features free Wi-Fi access, a coffee machine, and HD TV. This room features a private bathroom, iPod docking station, coffee facilities, mini-bar, HD TV, and a desk with an ergonomic chair. Bedding preference cannot be guaranteed. It is subject to availability. This room features free Wi-Fi access, iPod docking station, mini-bar, a coffee machine, HD TV, and city views. This room features modern decor, 2 double beds, free Wi-Fi access, a desk with an ergonomic chair, iPod docking station, mini-bar, a coffee machine, and HD TV. This suite features a king-size bed, a separate dining area, a sofa bed, HD TV, free Wi-Fi access and a kitchenette. 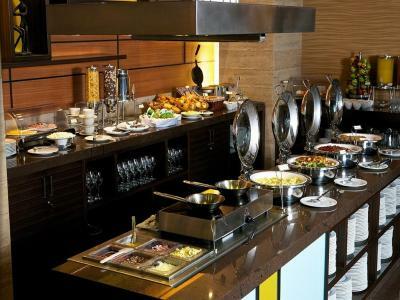 Guests are provided buffet breakfast and free privileged access to free services in the Sky Club Lounge. This room features modern decor, free Wi-Fi access, iPod docking station, mini-bar, a coffee machine, and HD TV. This room features free Wi-Fi access, HD TV, iPod docking station, mini-bar, and a coffee machine. Interconnecting rooms are available. This modern room features free Wi-Fi, coffee machine, HD TV and a king-size bed. 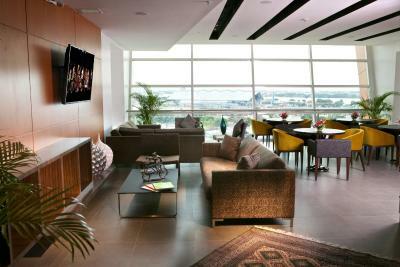 House Rules Holiday Inn Guayaquil Airport takes special requests – add in the next step! Holiday Inn Guayaquil Airport accepts these cards and reserves the right to temporarily hold an amount prior to arrival. Some of the waiting staff in the restaurant could be a little more proactive, very slow service at times. Reception staff very helpful when my luggage was delayed. Front desk arranged for my shirt to be washed overnight, delivered to my room at 08:00 - excellent service. Gave us the worse room ever! You look out the window and see a mass of air conditioners. I complained and was moved. The hotel was not busy so need for this. Dinner was not hot, more on the cold side. Close to the airport. Shuttle service. No washcloths in bathroom. Maybe normal for the area though. No wine selection in bar. Reception staff new very little English. Good food in the restaurant. Location - perfect for early flights out of airport. Even though the airport is very close to the hotel walking there looked too complicated.